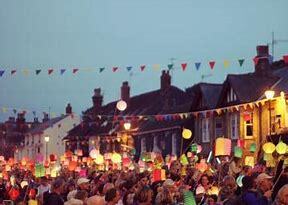 Aldeburgh is fortunate in being one of the few towns that has managed to continue its carnival tradition when so many others have been forced to stop. It has been around for 170 years old albeit under different guises over the years – if you were around in 1835, you would have known it as Ye Old Marine Regatta! The Carnival is spread over three days – in 2018 it is Saturday 18th, Sunday 19th and Monday 20th August. · Saturday is all about music with various acts performing across different venues in Aldeburgh’s town centre. · Sunday is sports day – from egg and spoon to a 10k Mini Marathon taking runners through the beautiful Suffolk countryside. · Monday is the culmination of the three days with the Carnival Procession down the High Street. If you fancy a dance then be sure to catch the Suffolk School of Samba. More inclined to a good military march – then we have a military band to keep you happy. Finally at the end of the day everyone moves through the town, lit by beautiful Chinese lanterns, and watches the spectacular firework display on the seafront opposite the White Lion Hotel. Of course you can pick and choose what you want to see. Simply turn up and enjoy. If you want to stay close by (and yet still enjoy the Suffolk peace and quiet) come and stay at Five Acre Barn (as of today we have availability)!